Not two full weeks into my new job as Digital Archivist at UVa on the AIMS grant, I rolled up my sleeves to facilitate and host an unconference with my fellow Digital Archivists. Our unconference would be two full days of discussions, demonstrations, lightning talks, and networking with digital archivists from around the globe. At first the thought was a little terrifying – I’m not even fully sure I know what this job is yet, how could I actually lead discussions on the salient topics? But my fears were baseless: all the unconference attendees were thoughtful, articulate, and lively participants. I learned much more from them than they probably did from me. The unconference was held on the 13th and 14th of May at the Omni Hotel in Charlottesville. The 27 participants represented libraries, archives, museums, and digital humanities centers across the US, Canada, and the United Kingdom. Despite the differences in our institutions, backgrounds, and training, we learned that we not only shared similar challenges, but also the same hopes for collaboration and innovation. The first day started off with a round of lightning talks. Each participant had 5 minutes to present a topic, project, problem or idea that they were interested in talking about. The variety in the talks was remarkable to me, traversing the breadth and depth of all that can be thought of as “born-digital” and the many processes involved in managing it. The lightning talks were also great way to get an introduction to each participant as well as their perspective or the particular issues they were dealing with in their institution. 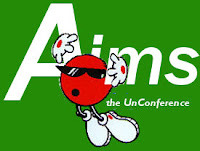 A brief outline of each of the talks is available on the AIMS Unconference Wiki. Management: Unconferencers tried to answer the question “how do we make born-digital materials workflow part of “the norm” in our profession?” Discussion touched on the need for institution-wide strategies, the viability of cross-institutional models, and generational issues. A fuller set of notes from the discussion can be found on the wiki at the link above. Tools: Discussion on tools ranged from the abilities and limitations of specific tools to the broader idea of how to collaborate and build better tools. Specific areas of tool development that were discussed included the management of restrictions and forensic tools developed specifically for the archival community. Access: Discussions on access continued to grapple with the issue of restrictions and how facilitate access while limiting abuse or misuse. Discussion moved on to questions of migration and emulation as well as the possibility of collaborating with researchers on analysis tools. Acquisitions: The entire spectrum of archival processing was really discussed in the fourth session: how can we capture and represent the context of digital lives? Enhanced curation techniques were advocated while the limits and ethics of digital forensics were discussed. Outreach: The final unconference discussion dealt with outreach through collaborations among institutions as well as collaborations with research communities. The group also touched on the importance of work with LIS programs and potential future archivists to ensure that they are coming to new professional positions prepared to deal with these questions. In addition to all the discussions, Saturday morning was devoted to tool demonstrations and small discussion groups. Tools like Archivematica, Rubymatica, Curator’s Workbench and Forensic Tool Kit were demonstrated, while other groups talked about imaging optical media, self-deposit repositories, web-archiving, and the potential development of a new tool for processing digital archives. After all that unconferenc-y goodness, the participants got together for a final discussion on next steps: where do we go from here? After talking through some of the options the participants agreed to try to continue to meet bi-monthly for informal phone conferences and to develop wiki pages for communicating about several broad areas: Curriculum Development, Best practices and Policies, Tool Development and Digital Research Communities. A specific suggestion was made to organize a “Day of Digital Archives” similar to the “Day of Digital Humanities” that’s become an annual event with our DH colleagues.